My kids are popsiclaholics and with the summer pretty much here I thought I'd try some kitchen experimentation with home made popsicles. 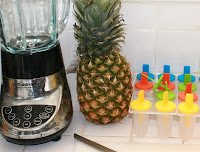 I picked up a few popsicle trays from the dollar section in Target and first tried blending up a pineapple. That worked well and adding a little coconut milk makes a mean pina-colada-pop. I'll be trying other whizzed up fruit as the summer progresses, because if they are going to ask me for popsicles every day then I figure at least they can get a portion of fruit in the form of one. I'm not sure how far I can push this one, but I may try getting some carrot in with peaches or something. I draw the line at brocolli-pops though. One pineapple made 24 popsicles, so with the price of pineapples here at the moment, that's somewhere between 10 and 15 cents a hit. Oh my goodness, you are such a cool Mom!!!! I especially like the pancakes! You are a pancake artist! I don't have any children but if I did, I sure would try out your ideas. Good work! Fuzzy Felt Friends and Family.